When Andrew Kong Knight isn't teaching art, he's rocking education rallies with his Angry Tired Teachers band. When musician and painter Andrew Kong Knight took over a chaotic art class at Hayward High School, in Hayward, California, it was for the love of, well, rent money. Eight hours later, he wanted to quit. His girlfriend issued a gentle reminder -- rent money! -- so he went back the next day. At some point, something clicked. He's continued to go back, for the last 14 years. Looking back, Knight realized it was his teachers that helped him through a tough adolescence -- a father who left, a mother suffering from depression. Little surprise, then, that he'd come to take teaching as seriously as he does. Indeed, teaching came to mean so much to him that he started a rock band, the Angry Tired Teachers, to fight for the profession. Education rally scheduled? Knight is probably already strapping on his guitar. Knight is that rare teacher who conducts a conversation in sunglasses, and peels off on a motorcycle afterwards. But where other rockers' hearts may beat for the open road or the open bottle, Knight's passion is for the classroom. He's a teacher through and through -- and frankly, not really all that tired or angry. He spoke with Edutopia from his home in Northern California. 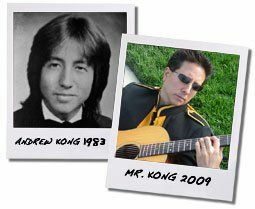 Andrew Kong Knight: When I was growing up in South Hayward, my mom always encouraged me to do what I wanted to do. That was drawing and painting, and playing violin. I was very shy at first. Music brought me out of that, when high school started. It brought me way out, actually – I became a class clown. I remember being sent out of class because I got the kids too riled up. But I always tried to be the respectful kind of funny guy, and to include the teacher on the joke. I was kind of an orphan. My dad left around the beginning of high school. Then my mom went into serious depression, went into her room and sort of stayed there. So teachers became my parents. I had a deep respect for them. Even when I joked around with them, I had a deep respect for them. I needed their guidance. I had this one incredible teacher, just a temporary art teacher my freshman or sophomore year. He'd been in Vietnam, and had one of his hands blown off. He only taught us a short while, but he was terrific. He saw my potential and my passion. He'd praise us; show us how to improve our work. I think with a lot of the other art teachers, it's like whatever you do in art gets an "A." That's not helpful. Having it just be playtime doesn't help. This teacher took art seriously as a discipline. I never guessed I'd become a teacher. Years later, I'd gone to art school and was teaching private violin lessons and working as a freelance illustrator. I wanted to do this mural project at Hayward high school and the school said no, what we need is an art teacher. My girlfriend and I needed the money, so I got an emergency credential. I was nervous as hell when I started. I brought samples of my work to the principal, but he didn't care about that. He said, "This class is all about discipline." Apparently the teacher before me had lost control, and the kids had gone wild. This art class was notorious throughout the school. They couldn't even get subs. When I first walked in, they were throwing stuff, screaming. Some of the kids were in juvie. Teaching that class turned out to be the best training I could have asked for. It forced me to decide how the rules would go, how to take control, where to lay down the line. You have to learn to define that line early on, set the tone. You're really creating a universe in your classroom, and telling the kids what kind of behavior is appropriate in that universe. The principal tells a story about coming by to visit a few days after I'd started, and it was quiet outside my classroom door. He thought, "Oh no, they killed Andy!" But really I'd gotten them under control, at least for a little while. I would try to talk with them, share my art, share what I'm about, do a lot of one-on-one things. I circulated, and tried to encourage what they were doing. It wasn't magic, but we made a connection. At teacher training, they tell you all the wrong things, “Don't talk about your life, don't be their friend.” But the teachers you always remember are the ones you connect with. If you do a little bit of connecting, you've got them. When my kids hear about my band, for example, they're into it. I can relate to a lot of these kids. A lot of them, they're living without both parents, or with grandma or something. I think a lot of teachers can't quite relate, but I understand it. And I can relate to the ones that aren't the best students. I tell them from the start, "I was not a great student." And when I encounter a good student, I tell them I really admire that. I think a lot of being a good teacher is being honest. Sure, you also do a fair amount of acting -- you have to put your game face on. But you can't fool them at a deeper level. I think the band does the same thing that teaching does, and that art does: It's about connecting. The Angry Tired Teachers started at a Christmas party. We were making fun of students, making fun of school bureaucracy, making fun of ourselves. Then it became serious when it looked like we might have to strike. We played rally after rally. When we finally did strike [in 2007], the union got us a flatbed truck and we toured the schools, as morale boosters. I don't talk about the band too much with my students, but when they find out, they're really positive. I got a couple nice comments from them on YouTube (see "You rock, Mr. Knight"). They don't throw tomatoes. Angry Tired Teachers came about just to vent frustration. Kids are rude sometimes, can't control their emotions, sometimes they're unreasonable -- and all that goes for the district, too! But the truth is, when you do what you love, you don't really work a day in your life. I think all of us in the band, we really just like being teachers. Chris Colin writes the On the Job column for the San Francisco Chronicle and is the author of What Really Happened to the Class of '93.